Push the grains to the next level: Dedicated to the real sound experimentalists! 120 extreme designed surround sounds and effects (crusher-sheets) for crusher-X. 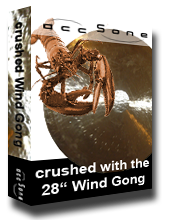 Based on over 40 high quality sound recordings of a 28" Wuhan Wind Gong this sound packages pushes you to the next level of grain experience! And yes, it is dedicated to all of you who are interested in strange, unconventional, extreme and cool surround sounds. You can give your next Ninja Movie the coolest surround sound track you ever heard. The effect ranges from never ending tuned gong phrase environments over barking explosions to extreme percussion eruptions around the listeners head. Think about your 5.1 subwoofer and give him something to work on! A must for advanced sound orientated designers and percussionists!